The Superbowl party at Loops proved to be heck on my wallet. However, WHAT a BARGIN! Ten percent off superwashed wool plus $20 off any purchase of $100. And beer. And we all brought food. My favorite find at the sale was the Tempted sock yarn in the color "Wicked Witch." I sang Defying Gravity the whole way home. 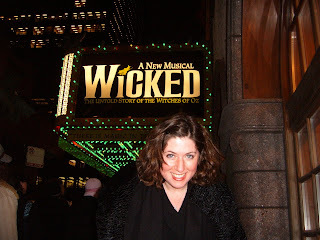 By the way, here's me at Wicked in Chicago -- my Christmas present from Mr. Knotty. I'm kinda hunched over. I think that picture was taken mid-squeee! I was muy excited. According Mr. Knotty, I was squeezing my hands and crying through the whole thing. It was awesome. 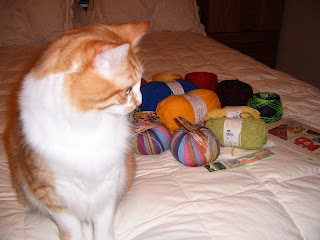 Pictured top: KnottyKitty smells delicious yarn. The yellow and gold yarn is going to be a TU scarf for the auction at the Aviator Ball for TASM. There's also some pink and brown hat yarn, baby-hat yarn, fair aisle sock yarn, yarn for a Jayne hat, yarn for Hat Attack, and a Smitten Mitten pattern booklet.